The history of the land along today's South Adgers Wharf is concealed by asphalt, cobblestones, and vague historical references. From 1722 until 1772, Charleston's Exchange was on East Bay Street, near the foot of Tradd Street. The 1739 Bishop Roberts Ichnography [map] of Charleston shows a fairly large building, labeled "Court House above and Exchange below." That building was almost certainly destroyed by the 1740 fire, which burned more than 300 houses and commercial buildings, an untold number of "storehouses, stables, and several wharves," and part of Granville's Bastion. Until the Exchange and Custom House was completed at the head of Broad Street in 1771, the businessmen and public officials who functioned as exchange commissioners and vendue masters probably met in a series of buildings along the waterfront near today's South Adgers Wharf. After 1772, the area was devoted to shipping and commerce. The early courthouse and exchange stood just inside the fortification wall fronting the Cooper River, near the southernmost redan. (Triangular projections extending forward from the wall, the three redans provided a wide sweep of visibility and firing range to the gunners inside.) After the brick redan at the foot of Tradd Street was dismantled in 1785, the wharf area was freely accessible from East Bay Street. In 1787, a city ordinance set out regulations for the three places where markets were to be kept: the beef market at the corner of Broad and Meeting Streets, the fish market below Queen Street, and "the market established on the low water lot fronting Tradd Street," where meat, poultry, fruit and vegetables, and all other foodstuffs would be sold. Six stalls in the Tradd Street market were reserved for the use of "planters that bring or send their own flock to market," suggesting that this waterfront location was also a market for live animals. Along with convenience, a waterfront location exposed buildings to constant risk of destruction, whether by storm or by accident. Fires were frequent. The market recalled by Charles Fraser as a "small low wooden building, at the lower end of Tradd-Street," was one of a number of market sheds that were built and rebuilt in the area. In 2008 and 2009, the Charleston Water System agreed to temporary delays in its scheduled sewer and pumping station improvements project, which called for removal of the cobblestones and paving from South Adgers Wharf, laying pipe, and restoration of the street surface. During these work stoppages, which lasted several weeks, members of the Mayor's Walled City Task Force, archaeologists from the Charleston Museum, and students at the College of Charleston excavated parts of the fortification wall, and elements of the foundations of several buildings. The team's evaluation of its findings is underway. The assessments and reports that result from the South Adgers Wharf archeological studies will answer many of the questions about the physical history of the redan, the exchange, and the lower market. Behre, Robert. "Buried treasure. Big dig giving historians better look at early fortification." The Post and Courier, June 25, 2009. Behre, Robert. "Tip of history. C of C archaeology students, instructors find redan, or point, of early city wall that was part of its defense; a look at wall's foundation next." The Post and Courier, June 17, 2009. Behre, Robert. "Wall-to-wall dig. Archaeologists, C of C students aim to uncover more remnants of old city." The Post and Courier, June 2, 2009. 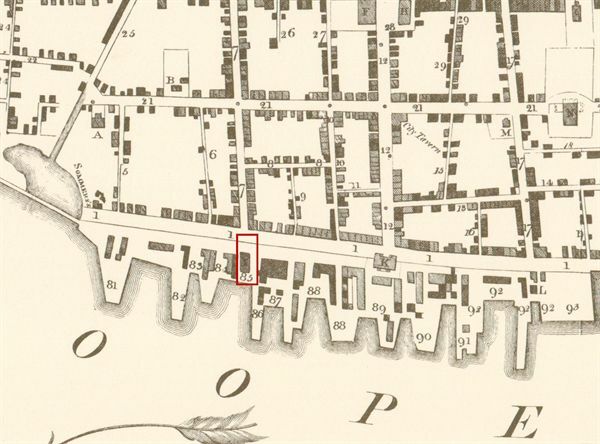 In 1739, the Exchange and Courthouse stood at the foot of Tradd Street, close to the shipping wharves. 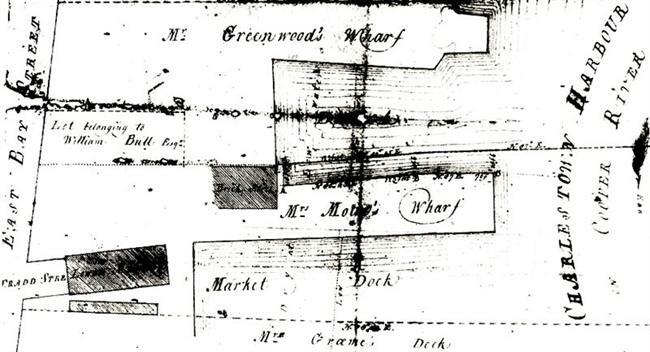 Lower Market and Market Dock on Joseph Purcell's plat drawn October, 1789. 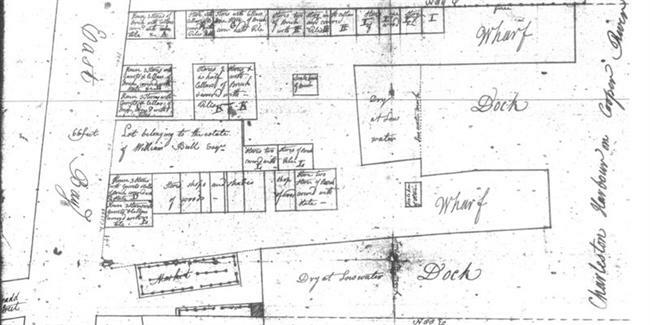 Market and dock delineated on June 1793 plat. 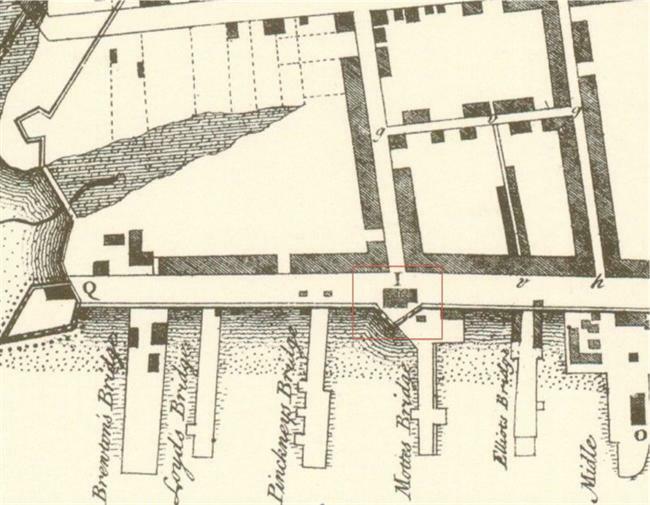 In 1788, the Market Wharf allowed farmers and planters to land produce and small animals near the market stalls [not shown on the map].